There’s a condiment on the market called Mayochup for those who’ve found it too laborious to mix ketchup with mayonnaise themselves. Even though the packaging of the two may be new, the combination itself isn’t—and it’s delicious. It’s better known as fry sauce (for dipping your French fries) and is the basis for Thousand Island dressing and burger Special Sauce. This had us thinking. Say you don’t want to shell out for a Mayochup bottle, because you figured it’s just easier to make fry sauce yourself. The logical next question is: What’s the ideal ratio of ketchup and mayo? We at The Takeout decided to be scientifically methodical with this experiment. 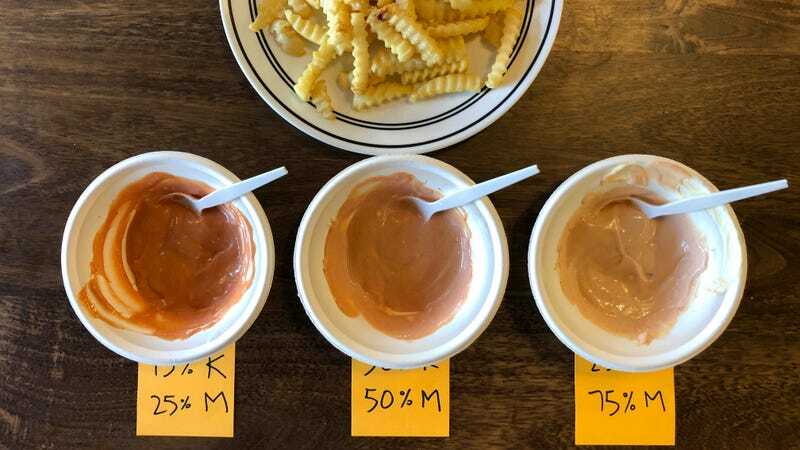 We used a digital scale to carefully measure out ketchup and mayonnaise in three distinct ratios: 75 percent ketchup-to-25 percent mayonnaise, equal parts ketchup and mayo, and 25 percent ketchup-to-75 percent mayo. We then heated up French fries and mozzarella sticks for dipping, and drafted our usual crowd of office colleagues to help us make up our minds. That is, we tried to. One surprising development we discovered in this taste test is how many people straight-up hate mayonnaise. A smaller number of people straight-up hate ketchup (it’s Chicago, after all). Even some of our brave taste-test regulars wouldn’t touch it. The handful of people who remained fell into two camps. Most preferred the 50/50 ketchup-mayo option, calling it, unsurprisingly, perfectly balanced. The 50/50 offered just enough richness that cuts through the vinegary bite of the ketchup, with a satisfying amount of sweetness. Some (including myself), found the 75 ketchup/25 mayo too cloyingly sweet, though it definitely had its admirers, probably because it was the closest for people who like to dip their French fries in ketchup. Similarly, the 25 ketchup/75 mayonnaise ratio offered creaminess with just the barest reminder that we added ketchup. Especially against highly seasoned vehicles such as mozzarella sticks, the ketchup in this combination disappeared completely. It tasted like straight-up mayonnaise, which maybe the Belgians like to dunk their fries in, but it just wasn’t that popular around Takeout offices. And so our scientifically rigorous experiment yielded a rather boring but sensible answer. Our determination of the ideal ratio of ketchup-and-mayo for fry sauce is… half and half. As for Mayochup itself? It didn’t taste like straight up mayo + ketchup, but more reminiscent of tartar sauce without the relish, like the relish was hanging around there for awhile but recently departed. Not surprisingly, it’d probably works best on a fish sandwich, fish fingers, maybe chicken nuggets. After all, aren’t all food items really just vehicles for condiments?